Antisemitism: A History offers a readable overview of a daunting topic, describing and analyzing the hatred that Jews have faced from ancient times to the present. 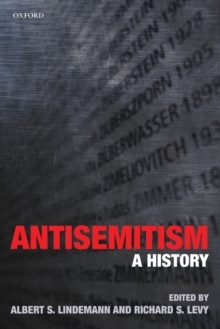 The essays contained in this volume provide an ideal introduction to the history and nature of antisemitism, stressing readability, balance, and thematic coherence, while trying to gain some distance from the polemics and apologetics that so often cloud the subject. Chapters have been written by leading scholars in the field and take into account the most important new developments in their areas of expertise. Collectively, the chapters cover the whole history of antisemitism, from the ancient Mediterranean and the pre-Christian era, through the Medieval and Early Modern periods, to the Enlightenment and beyond. The later chapters focus on the history of antisemitism by region, looking at France, the English-speaking world, Russia and the Soviet Union,Eastern Europe, and Nazi Germany, with contributions too on the phenomenon in the Arab world, both before and after the foundation of Israel. Contributors grapple with the use and abuse of the term 'antisemitism', which was first coined in the mid-nineteenth century but which has since gathered a range of obscure connotations and confusingly different definitions, often applied retrospectively to historically distant periods and vastly dissimilar phenomena. Of course, as this book shows, hostility to Jews dates to biblical periods, but the nature of that hostility and the many purposes to which it has been put have varied over timeand often been mixed with admiration - a situation which continues in the twenty-first century.